Fathima's Indian Kitchen - Glen Iris uses their own specialised couriers to deliver their food. Save $15. 2 x Samosa, 2 x Chicken Tikka, 1 x Butter Chicken, 1 x Lamb Rogan Josh, 1 x Aloo Mutter Paneer, 2 x Saffron Rice, 2 X Plain Naan Bread, Raita, Chutney and Pappadams. Save $20. 4 x Samosa, 4 x Chicken Tikka, 2 x Meat Curry, 2 x Veg Curry, 4 x Saffron Rice, 4 x Plain Naan Bread, Raita, Chutney and Pappadams. Stuffed with potatoes & peas and deep fried with white flour pastry. Made from chunks of cottage cheese marinated in spices and grilled in a tandoor. A lamb cutlet marinated with spices and yoghurt and cooked in the tandoor. Cooked chicken tikka tossed in Fathima’s special sauce. (Chefs Receipe). Chicken Tikka, Tandoori chicken, lamb cutlet and sheek kebab served on a platter. Dry Gobi Manchurian is an Indo Chinese dish of Cauliflower tossed in a delicious Manchurian sauce with diced onion, capsicum in garlic flavour. Noodles cooked with green peas, green beans, shredded carrot, onion, capsicum in a soya sauce and sweet chilly sauce flavor and garnished with spring onion. Cooked Rice tossed with green peas, green beans and shredded carrot, onion, capsicum in a soya sauce and sweet chilly sauce flavor & garnished with spring onion. Deep fried Cottage cheese or chicken tossed with diced onion, capsicum, spring onion and cooked with soya sauce and sweet chilly sauce flavor and garnished with spring onion. Chicken with noodles cooked with shredded carrot, onion, capsicum in a soya sauce and sweet chilly sauce flavor and garnished with spring onion. Chicken and Rice tossed with shredded carrot, onion, capsicum in a soya sauce and sweet chilly sauce flavor and garnished with spring onion. Rare combination of eggplant mushroom and peas cooked with creamy texture with methi leaf and cumin seed flavor. Chicken cooked with butter sauce in a creamy texture using chef’s own choice of spices and recipe. Your choice of meat cooked with green chilly sauce flavor, diced onion using special chef’s choice of spices. Your choice of meat or cottage cheese cooked with special sauce made by chef which has the flavor of sweet, sour and spicy (Can be made Medium Spice). Your choice of meat or cottage cheese cooked with coconut, mustard seed and pepper flavor using chef’s special choice of spices garnished with red chilly and Julian’s of onion. Mashed eggplant cooked with your choice of meat or paneer in a south Indian style. Tender pieces cooked in a hot spices, herbs and a touch of vinegar. Coconut flavour, mustard seeds, and curry leaf in a South Indian style. Medium spiced with ginger and cracked pepper. Cooked with a creamy texture. Onion, tomatoes and capsicum cooked with special spices. A very popular flavoured curry cooked in a Kashmiri style. Cooked with coconut, mustard seed in a Goan style. Cooked with spinach and flavoured with cream and spices. Combination of tender pieces and vegetables. A curry cooked with pickle flavour. Tender pieces cooked with the combination of yellow lentils. 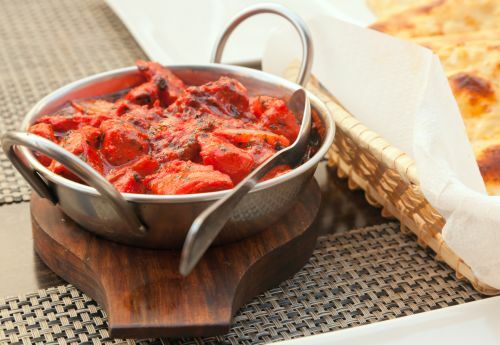 Chicken tikka pieces cooked to perfection in mildly spiced tomato butter sauce very popular. Similar to butter chicken with onion, tomato, capsicum and spices. Chicken cooked with mango flavoured curry. Chicken Cooked with diced onion and capsicum until brownish color and served semi dry. Goat cooked in onion base sauce with chef’s best slecetive spices. A dry preparation of mushroom with diced onion, capsicum and potato. Potato, cauliflower and green peas cooked in onion sauce and flavoured with spices. Mixed vegetables cooked in an onion cashew nut creamy sauce. Chickpea, potato and diced onion cooked in onion sauce and flavoured with herbs. Mixed vegetables cooked with vindaloo sauce and touch of vinegar. Yellow lentils cooked with Punjabi tadka. Diced cottage cheese cooked with onion and capsicum in an onion sauce. Spinach and cottage cheese cooked in curry sauce and flavoured with cream. Rice cooked with lemon, coconut, mustard seed and yellow dal. Rice cooked with green peas and cumin seed garnished with fried onion. Plain flour bread stuffed with sultana. Plain flour bread stuffed with cottage cheese sauce. Plain bread stuffed with minced lamb sheek kebab. Cottage cheese and shredded cheese stuffed and cooked in tandoor oven. Whole wheat flour bread with butter applied. Whole meal bread filled with mashed potato and spice. Whole wheat fluffy bread stuffed with fresh mint. Stuffed bread with potato, peas cheese. Grated cucumber and carrots mixed with yoghurt. Cooling yoghurt flavoured with mango.